One of Orangeville’s worst-kept secrets is finally out in the open, with Mayor Jeremy Williams having filed his papers seeking re-election in October’s municipal election. Coming to the end of his inaugural four-year term in the town’s big seat, Mayor Williams noted it was “an easy decision” to put his name forth for consideration. In 2014, he defeated incumbent Rob Adams following a bitter campaign. With two competitors this time around – local realtor Sandy Brown and behavioural therapist Darrin Davidson – it’s shaping up to be an interesting couple of months before the Oct. 22 vote. 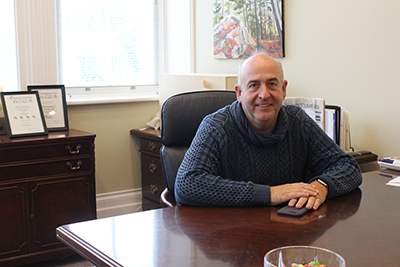 Sitting down with the Citizen this week, Mayor Williams looked back on these past four years with fondness. While he recognizes that the atmosphere at town hall hasn’t always been the best, the mayor pointed to several “important” issues this council has tackled head-on during this term. Mayor Williams said, in his role as chair of the Orangeville Police Services Board (OPSB), that he repaired the relationship between the police association and the OPSB and worked with the, at the time, new local Police Chief Wayne Kalinski to convey the importance of tightening the service’s annual budget. “We now have a strong, viable service that is economical. I’m very proud of that,” Mayor Williams said. Also this term, council had chipped away at what our mayor described as “decades’ worth” of accumulated deficits that he says was previously ignored, to the point that, today, it is completely paid off. They have also ended the practice of dipping into municipal reserves to pay for big projects, instead focusing on boosting the Town’s coffers. Perhaps this council’s biggest accomplishment over the past four years, the mayor says, has been establishing a five-year plan. Boasting a healthy laundry list of checked-off items from this term, which also includes long-awaited renovations to the municipality’s sewage treatment plant, Mayor Williams stated now was not the time to rest on any laurels. It is expected there will be a heavy turnover on Council, with incumbents Gail Campbell and Sylvia Bradley having announced their retirement and Deputy Mayor Warren Maycock and Coun. Scott Wilson still quiet ahead of tomorrow’s nomination deadline. As such, Mayor Williams has called on this next council to push on and create a legacy of its own. What that legacy will be, Mayor Williams could not possibly speculate. However, as one of seven potential voices on this next council, he certainly has some ideas. “I think transformative is probably the best way to describe my platform,” Mayor Williams said. Mayor Williams assured the Citizen that any move to further embrace 21st century technology would not result in a direct loss of jobs. According to the Town’s website, the municipality boasts 180 full-time members of staff, employs another 180 part-time workers and brings on a group of roughly 100 seasonal workers every year. Seeking to clear up something that has been used against him this term, Mayor Williams wanted to talk taxes. Ahead of the 2014 election, he promised local residents there would a zero percent tax increase during his first year. In the end, Council implemented a 2.4 percent increase to the tax levy. Still, the mayor maintains that amounted to a “true” zero percent tax increase once assessment and inflation had been taken into account. Mayor Williams went on record to make a similar promise to the one four years ago, saying he would not support any future budget above and beyond a zero percent increase, once inflation and assessment has been taken into account. When asked why voters should give him another four-year run, he pointed to his track record and said simply he doesn’t believe there’s a better candidate for the job.